Make 'Em Laugh: Short-Term Memories of Longtime Friends, by Debbie Reynolds. Sadly, I didn't feel like this book was necessary at all. 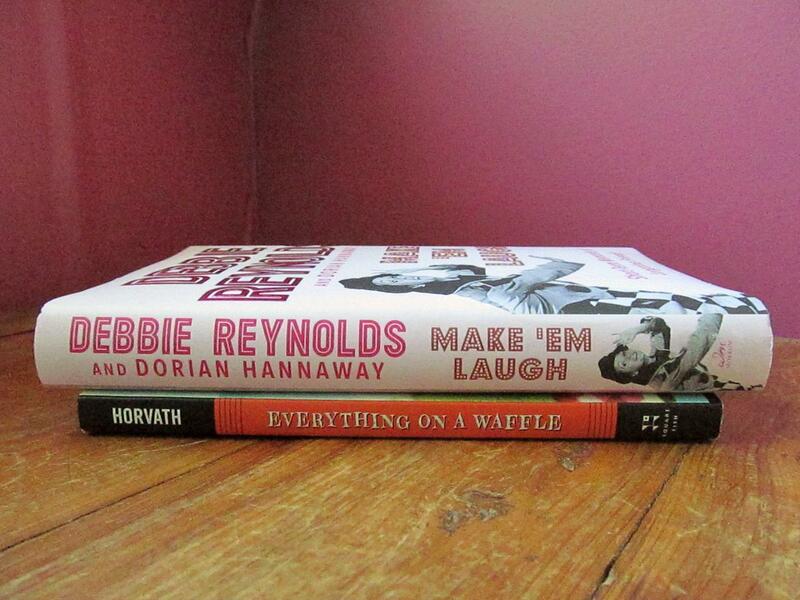 I really enjoyed Debbie's first memoir, and her second one was pretty good. But by this point, there weren't many untold stories left. So I found this book a little dull and very disorganized and random. Everything on a Waffle, by Polly Horvath. I first read this book three years ago and thought it was quirky and very endearing. I wanted to reread it so I could finally read the sequel (which I've almost finished now). It was thankfully just as good as I'd remembered! Everybody has off months in their reading, don't feel bad about it! I saw on Goodreads that you enjoyed it! It really is a sweet little book. Your reason for reading less sounds totally legitimate. :) Again, I'm so happy for you and Kenny! Yes, totally legitimate! :) Thank you! Knitting: navy Marion cardigan (plus a dress).